American Plastic Toys has great toys for kids. Their product line is snow goods, riding toys & wagon, vehicles & boats, palls & shovels, garden toy, sand toy and sport play. 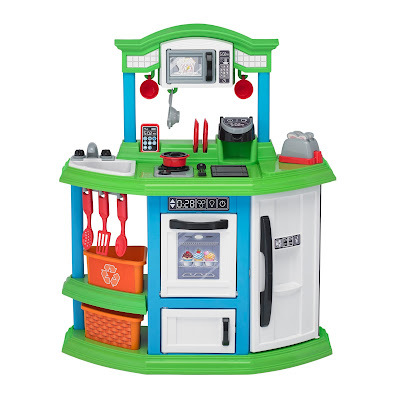 One of American Plastic Toys is their Cozy Comforts Kitchen. I just adore the realistic kitchen. It has complete kitchen accessories. The kitchen design has raised gas burner, knives and spoons, two sets of plates, large spoon, cups, forks, two pieces of toast, touch screen phone, strainer spoon, muffin tin, pan with lid, single-cup coffee machine that makes boiling water sound when pots and pans are on it. The Cozy Comforts Kitchen arrived within 4-5 days. I took the Cozy Comforts Kitchen out of the box and followed the assembly instructions. It took me a bit to assemble but I got it! My son Davin fell in love with his kitchen. He played and used his imagination by drinking from a cup, using a spoon to eat and mixing coffee in a cup. Whenever, my son is in his room. 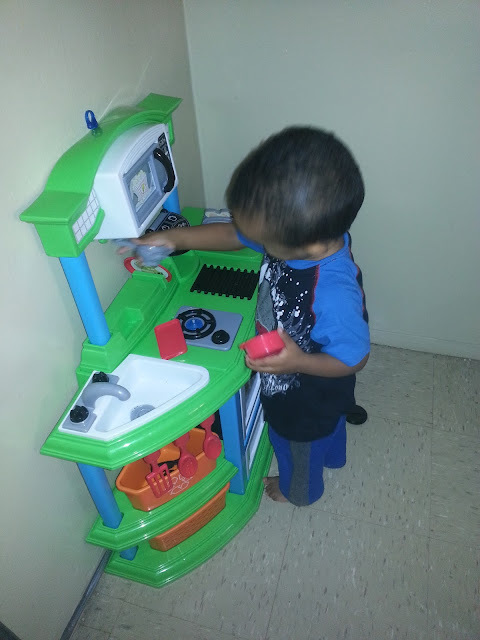 He plays with his kitchen. I just love seeing him having fun. The Cozy Comforts Kitchen stands just over three feet tall. It's easy snap and press to fit for assembly. The price is very reasonable for the low retail price of $35.00. It's a very descent size for a child. The kitchen is suitable for ages 3+. I really do recommend the Cozy Comforts Kitchen for a child. It comes available in colors green/blue and pink/purple. It would make a great holiday gift for a boy or girl. A child will enjoy their time playing in a kitchen. To view the Cozy Comforts Kitchen and get information visit American Plastic Toys. To find toys from American Plastic Toys visit your local retailer American Plastic Toys. Stay connected on their latest products and offers follow American Plastic Toys on Facebook and Twitter. awww that little kitchen looks so cute, I can see he already loves his kitchen!! The price is also very reasonable, this could be the perfect holiday gift for kids! 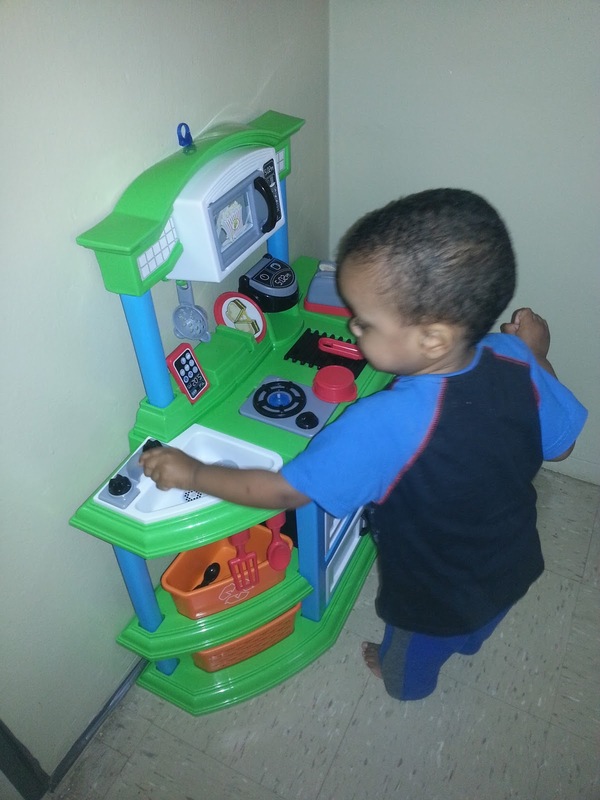 Every kid needs a kitchen of their own, lol..
Wow! That kitchen comes with everything. I just added it to my grand children's Christmas list. This kitchen is so cute! Great little set up for a toddler. I don't know ... you might have a future chef in this little guy! That's a great price for such a nice playset. Pretending to be a chef is very good for children, they learn to appreciate home cooked food and will also show interest in healthy food options.